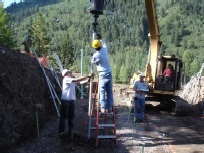 Install 41 Model 288 helical piles for a future pool and its associated pool deck; minimum depth of 15’ and variable design load ratings based on engineered locations between 14 and 40 kips. 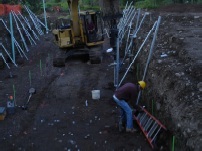 Installation hurdles included: Weather factors, installation in backfill materials consisting of cobble and large boulders. Potential for damage or inability to advance piles into the soils. Site access and terrain limitations. Incorporate a combination of special equipment including: 312 CATTM Track-hoe, custom fabricated mounting bracket for Pengo 12k hydraulic rotary torque drive unit to allow for reach and maneuverability in tight spaces. Large buried cobble and boulders limited minimum penetration depths and location accuracy to construction plans thus creating a need to install additional piles spaced closer than engineered requirements and in some cases shallower due to limit in advancement. Many instances of reversing, removing and relocating piles occurred due to this. Multi-layered winter and summer clothing was required to battle against the Colorado Rocky Mountain weather patterns. accommodate for additional pile installations as needed. 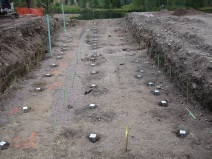 Fortunately, in the end, enough materials were brought to site to accommodate for the additional piles to be driven.